Not to overstate things, but "The Lorax," Dr. Seuss' none too subtle illustrated children's book, remains a classic environmental cautionary tale ever penned for a young audience. The story itself is simple: a little boy visits a remorseful hermit called the Once-ler and learns how the creature's greed, carelessness and ambition led to the destruction of the once-beautiful and thriving Truffula forest. Forty years ago, the book was ahead of its time; so much so that its message was dismissed in many circles as nonsense and overly excessive in its metaphors. Today, the 1972 book is so dead-on the mark it, words can barely do it justice. But when expanding Seuss' story into a feature length animated film, directors Chris Renaud and Kyle Balda have, in some ways, missed -- or perhaps just muddled -- the point. Erase every moment of that book from your mind. The directors make their affection for all things Seuss clear. But they fill out the 45-page book with at least thirty minutes of material that takes away from the heart of the story, rather than expanding on it. The Once-ler (voiced by Ed Helms) still shares the error of his ways with a young boy (Zac Efron), recounting the destruction of the Truffula forest at his hands, the fate of the animals who lived there, and the arrival, subsequent warnings and sad departure of a strange little beast called the Lorax (Danny DeVito). But instead of focusing on the Once-ler's struggles with the Lorax, the filmmakers dream up a story for the young boy as well, whom they promptly dub Ted Wiggins. Ted is in love with a girl named Audrey (Taylor Swift) who mentions she'll marry any man who can show her a real tree; as opposed to the inflatable trees and bushes that adorn Thneed-Ville, a seemingly idyllic corporate-run dystopia that, unbeknownst to its citizens, lies at the center of a vast wasteland. Ted, with the help of his dear grandmother (Betty White), does the unthinkable and ventures beyond the wall to speak with the Once-ler, even though it lands him in hot water with Aloysius O'Hare (Rob Riggle), a sinister bottled-air magnate desperate to keep Thneed-Ville under his thumb. The Once-ler isn't exactly forthcoming, but, over several visits, tells Ted how the Truffula trees disappeared. Apparently, in his younger, sprier days, the Once-ler arrived in the Truffula forest while searching for raw materials and promptly cut down his first tree. From that first stump appears the Lorax, a powerful creature with... no powers whatsoever. (At least none that he is willing to use.) The Lorax sets about to thwart the Once-ler's plan to use the trees' unique leaves to manufacture and sell Thneeds, soft sweater-like contraptions with a thousand-and-one uses. As time passes, the Once-ler's family arrives and makes things exponentially worse, the Once-ler is consumed by his own greed, and the Lorax watches as his precious forest is eradicated. Meanwhile, in the present, Ted slowly comes to the realization that a travesty has occurred and maybe, just maybe, he can help right the Once-ler's wrong. The directors and screenwriters bulk up the film to an ungainly size, splitting the story into two distinct narratives and diminishing both in the process. And they don't stop there, cramming in too many extraneous characters and subplots, sometimes reducing the Lorax to little more than comic relief, and generally heaping so much garbage on top of the film's message that it nearly suffocates. Yes, when adapting a children's book for the big screen, filler is a necessity. But it needn't be a necessary evil. Horton Hears a Who was one of the most satisfying and entertaining Dr. Seuss adaptations to date. The Lorax, on the other hand, nails the look of a dazzling CG-animated Seuss film, but fails to capture the heart and soul of the book or justify its inflation into a lumbering feature film. And that's really The Lorax from start to finish: a worthwhile message lost in translation. So much of the film has been invented that the core of the Dr. Seuss book is buried beneath the rubble. The Once-ler's flashbacks are convoluted, the Lorax's attempts to sway the Once-ler are mired in slapstick and misplaced silliness (again, typically by presenting the weary Lorax as a punchline to several jokes), and the bits of the book that have been retained are often unrecognizable. Too much happens, too many plotlines unfold, too many characters have a major stake, too many movies have been shoved under one roof. Will kids enjoy The Lorax? Absolutely. Will adults? Eh. Now on Blu-ray, any parent with a kid who loved this film shouldn't hesitate to pick it up. On Blu-ray the film looks and sounds fantastic, regardless of how the story plays out. Along with comes a nice side of special features, such as; Audio Commentary by director Chris Renaud and co-director Kyle Balda. Mini-Movies: "Wagon Ho! ", "Forces of Nature", and "Serenade." A Making of the Mini-Movies; A Deleted Scene; O-Hare TV: The Lorax performs with commercial interruptions advertising O'Hare products. Expedition of Truffula Valley: A cute interactive tour of Thneedville and the Valley. Seuss to Screen: A short look at adapting The Lorax for the big screen. Three Kids' Games: "Once-ler's Wagon," "Get Out of Town" and "Truffula Run." And finally a sing-a-long song. "Unless someone like you cares a whole awful lot, nothing is going to get better, it's not." Family films are an easy sell. They don't have to be great, just good enough to make the kids laugh, the parents pleased that the kids are laughing and... that's about it. Dr. Seuss' beloved, environmentally conscious children's book deserves more than what this film is. As an adaptation, it underwhelms. As a Seuss adaptation it under-delivers. As a family film, it does what it needs to do. In the end, The Lorax isn't all it could be. 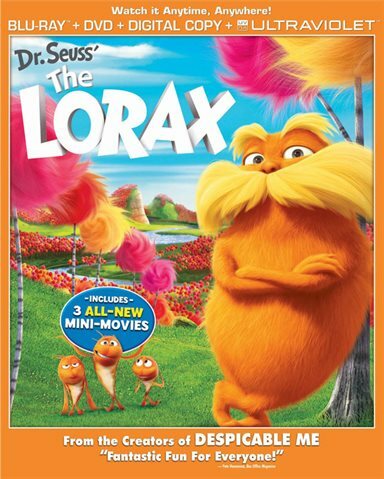 Download Dr. Seuss' The Lorax from the iTunes Store in Digial HD. For more information about Dr. Seuss' The Lorax visit the FlickDirect Movie Database.